Your ‘Cheeky Monkey’ Brain is made up of the limbic system and the brain stem. Its two agendas play a very large part in the way your ‘Cheeky Monkey’ brain reacts to the world around it. Because it is focused on survival and reward, it relies on feelings and impressions and can be either constructive or destructive. Your ‘Cheeky Monkey’ lives in a world of black and white. It is quick to form an impression on little, if any, evidence and usually won’t give way when it reaches a conclusion. It makes guesses and fills in detail by assumptions that are typically based on a hunch, paranoid feelings or defensive thoughts. The chances of your ‘Cheeky Monkey’ brain making the right interpretation of what is happening may not be very good, but sometimes the gut feeling it has is right. It does not ‘think’ in the accepted sense of the word. Your ‘Cheeky Monkey’ brain is constantly vigilant to danger and so it tends to react negatively. As a result, it can over-react to situations and fuel them with high and intense emotions. Whenever it perceives something is wrong, it tends to start worrying about what might happen and then get things completely out of perspective. In turn, it can therefore, become very unreasonable and end up looking foolish. Your ‘Cheeky Monkey’ brain judges others quickly and without mercy. These judgements are not open to reasoning, so the ‘Cheeky Monkey’ is unlikely to be persuaded that it may be wrong. The second step to managing your ‘Cheeky Monkey’ and understanding how it may be sabotaging your success and happiness, is to be aware of its presence and how it is actually influencing your decisions and actions. Self-doubt is one of the biggest challenges we all must overcome in order to succeed and live a fulfilling and happy life. In your life you will have many experiences, some good and some bad. Unfortunately, your ‘Cheeky Monkey’ tends to connect your experiences together, which then support your beliefs about yourself and others. Some of these beliefs can be negative and less than helpful. Regrettably, your ‘Cheeky Monkey’ is inclined to do a great deal of self-analysis. This can cause all sorts of problems as you go through life and it can often set you up for failure. This can happen in all sorts of circumstances; when you are looking for a new and exciting job or starting a new relationship. Your ‘Cheeky Monkey’ is primarily looking out for you, making sure you are safe physically and emotionally. But your ‘Cheeky Monkey’ over reacts, getting its response wrong and prevents you from taking risk based on its previous experience and how it associates that with any current ‘risk’. Your ‘Cheeky Monkey’ plays a key role in developing and carrying out your instinctive behaviours and emotions. It’s the part of your brain that reacts to the world around you reflectively and instantaneously, in real time and without thought. It’s involved in processing and remembering strong emotions such as fear. Your ‘Cheeky Monkey’ is your brain’s alarm system to aid your survival under threat. The problem is that this ‘alarm system’ is not always accurate, relevant or helpful. Imagine that you once had an embarrassing experience of standing up and speaking at a public event. Your ‘Cheeky Monkey’ will attempt to protect you by kicking into play the ‘fight or flight’ response. Your ‘Cheeky Monkey’ will remind you how stupid you were to attempt it before and encourage you to not do it again. It may become agitated and upset if you ignore its advice. But you can manage your ‘Cheeky Monkey’ and calm it down. The first step is to ‘acknowledge’ it. It’s important to acknowledge your ‘Cheeky Monkey’ and let it have its say about the situation. If it is upset or agitated about something the first thing to do is release this emotion or opinion. You must allow your ‘Cheeky Monkey’ to express its emotions and have its say – no matter how irrational – before it will ‘listen’ to your opinion. Make sure you take as much time as needed to do this. It may take a couple of attempts. Once you have allowed the emotions and opinions to be expressed in a safe place (you don’t want to do this in a public place!) 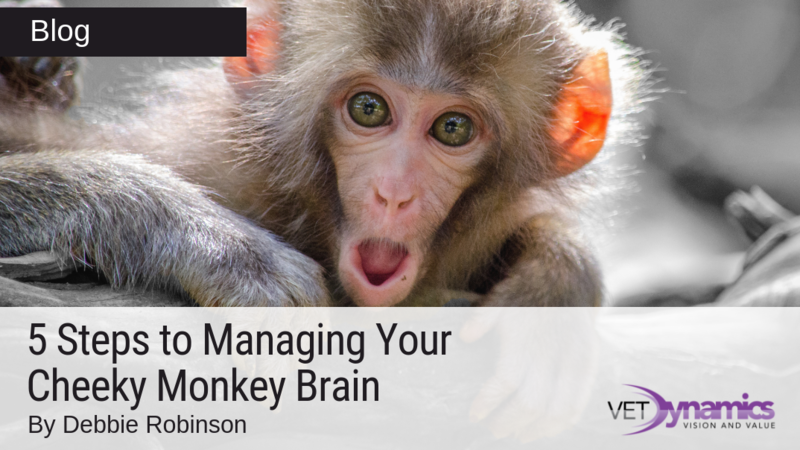 you can move on to managing your ‘Cheeky Monkey’. Once your ‘Cheeky Monkey’ has had time to express its emotions and opinions you are in a much better position to deal with it in a more controlled way. If you have allowed it sufficient time to express its concerns it will be more willing to receive your opinions and information to address its fears and concerns. By using truth, facts and logic you can calm your ‘Cheeky Monkey’ down and reason with it. Your ‘Cheeky Monkey’ will always be with you, looking out for you. It’s not good or bad it is just your own ‘Cheeky Monkey’. How you manage it takes a little practice, but it’s so worth the effort.